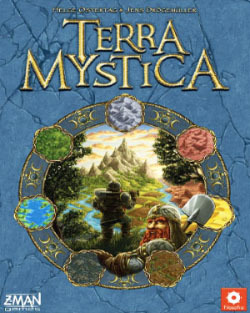 Terra Mystica is a strategy game for 2 to 5 players. You will control one of fourteen different races and trying to expand your power by terraforming (transforming) the landscape in your favor to build your structures. Eeach race has unique special abilities and costs associated with actions, they are also limited to building on only one of seven different terrain types apart from the terraforming spaces. The 14 races, along with their home terrain types, are: desert (Fakirs, Nomads), plains (Halflings, Cultists), swamp (Alchemists, Darklings), lake (Mermaids, Swarmlings), forest (Witches, Auren), mountain (Dwarves, Engineers), wasteland (Giants, Chaos Magicians). When you build temples, you gain more influence in the for cults: earth, air, fire and water. Dwellings are needed to have more workers (they are the key to building) at hand. For money, you will have to invest in building trading houses. A stronghold will activate your race's special ability. Each race must also develop its terraforming skill and its skill with boats to use the rivers. All your structures may be upgraded by multiple steps to increase abilities and the production of resources, workers, priests, money. One unique aspect of the game is its power point mechanic. These points are used to cast spells and are split among three bowls. When a point is gained, it first move from bowl one to bowl two. Only when bowl one is empty, they can move from bowl two to three and now they can be used. After you use them, they will return to bowl one. Because you are not playing alone, the proximity of the other players will limit your expansions and offer you also benefits and opportunities. This conflict is the source of the game's appeal. Cult Bonus and Cleanup phase. You begin the game with a bonus card which may grant more coins or workers and spades (crucial for transforming habitable terrain). After 6 turns players count their points. The player with the most victory points is wins the game. You score 8 points if you are the player highest on any cult track, 4 points for the 2nd player and 2 points for the 3rd player. Ties divide the points between the players. You also count the number of your structures that are adjacent or indirectly adjacent to each other. The player with the highest number of connected structures is awarded 18 points, the 2nd gets 12 points and the 3rd receives 6 points. Again any ties are divided between the players. 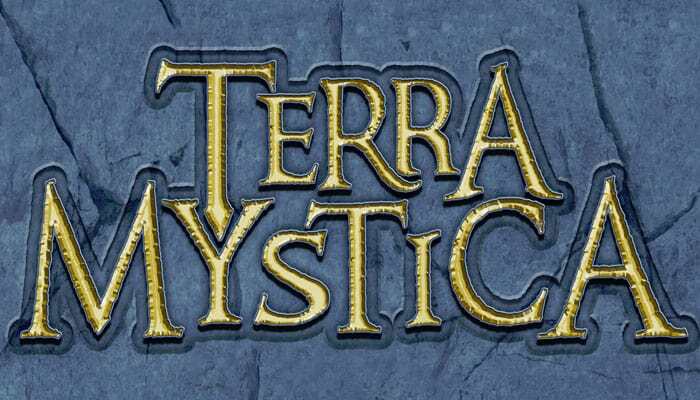 Terra Mystica requires strategic skills and luck is not much involved. On the end, it's all about managing your resources and gaining an advantage in victory points. 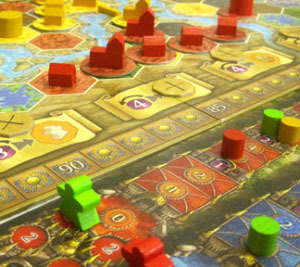 The game is not so easy to learn because as your resources grow, the options do as well. There are also many small rules exceptions. The game is created by Helge Ostertag and Jens Drögemüller and was first published in 2012 by Feuerland Spiele. 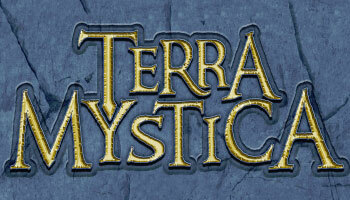 The setup of Terra Mystica is quiet complex.